Hitomezashi is a simple form of traditional Japanese embroidery done entirely in equally sized running stitch. The interaction of the horizontal and vertical stitches can create some very intricate repeating patterns. Hitomezashi is also known as one-stitch Sashiko. Sashiko is a more diverse version of traditional Japanese embroidery. Please click on “Description” below for System Requirements and further information about this program. This program was written for computers running either 32 bit or 64 bit Windows Vista, Windows 7 or Windows 8 on a computer with either an x86 or x64 CPU. The software expects .NET Framework 4.5. It has also been tested on a MacBook Pro running Windows 8.1 through Parallels Desktop. Printing requires a printer that can accept XPS file format documents. OneNote, part of the Windows 8 operating system, or Microsoft XPS Document Writer on Windows 7 allow you to print to a document rather than to paper. The software has a built-in camera that saves screenshots to either PNG, BMP or JPG format. These are identical to what is printed using the print option. This software helps you design Hitomezashi patterns that you can sew. The horizontal and vertical stitch patterns have a number of tools to modify and visualise the patterns. To help you get started there are a number of example designs in the presets. You can also save up to 4 of your own designs. You can have a grid displayed to show you how to stitch out the design. Just in case you cannot see the wood for the trees there is also a detail button to show you only one set of vertical and horizontal patterns sewn out. 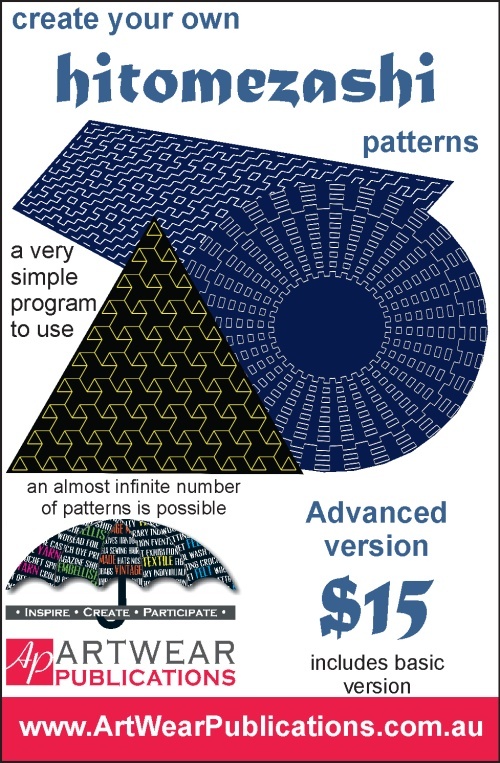 The more complex overall pattern is created by repeating these simple sets of patterns. If you have a suitable printer you can print either a colour or black & white version of the pattern. These can help you sew the pattern. There is a range of colours you can select for the background/fabric and the thread for the stitches. In the advanced version of the software you have greater flexibility in using the traditional method, plus there are 5 variations (Mirror, Triangle, Tilted, Perspective, and Circle) that bend the rules to create exciting alternatives. Each of these has their own additional controls for creating the patterns. This software is copyright to ArtWear Publications Pty Ltd and Actuarial Solutions Pty Ltd. By purchasing this software you agree that you will not share, loan, copy, sell, adapt or modify the program, attempt to reverse engineer the program, attempt to imitate the program, or in any other manner infringe the copyright and intellectual property rights of ArtWear Publications Pty Ltd and Actuarial Solutions Pty Ltd. You may use your resulting embroidery in embroidered items for sale—however, we take no responsibility for the quality or saleability of the end product.